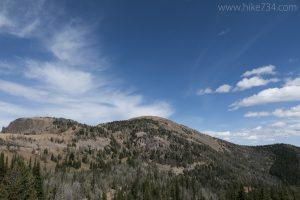 This one-way hike up the beautiful Specimen Creek Trail takes you past a pretty alpine lake to Big Horn Peak via the Sky Rim Trail, then out the Black Butte Trail. Specimen Creek is the largest creek in the drainages that head up to the Sky Rim Trail. The trail follows along the banks of the creek as it flows through the forest and meadows that are excellent habitat for a variety of wildlife. An old burn has opened up a hillside to the north which is full of petrified tree “specimens” for which the creek was named. Beyond that, it’s more forest and small meadows with scant views of the surrounding peaks until you get to the head of the drainage. While the trail is mostly level for approximately the first 6mi/9.5km, the last couple to Shelf Lake are full of switchbacks that climb out of the drainage and up to the ridgeline. Views begin to open up as you approach Shelf Lake, which is a nice alpine lake tucked below the ridge as well as a great lunch spot. From here the trail climbs up to the ridgeline and joins the Sky Rim Trail where the views become panoramic. The Sky Rim Trail runs along the ridgeline which is also the park boundary. This ridge-walk does its best to follow the actual ridge, which means a lot of up and down. The benefit of all of this extra effort is that you spend most of your time with great views on either side of the ridge. As you get closer to Big Horn Peak, the terrain becomes more dramatic and culminates in a rather harrowing goat trail traverse that may be too much for those with a fear of heights. Views from Big Horn Peak are fantastic. Bighorn sheep frequent the area and mountain goats can often be seen on the steep cliffs on the north face. From here, drop down the Black Butte Trail to the road. (See Black Butte Trail for description.) Getting back to the Specimen Creek trailhead requires arranging a car shuttle or a 2.3mi/3.6km walk along the road. 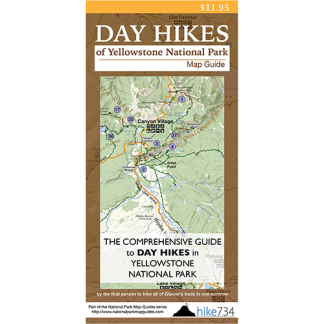 Trailhead: The trailhead for the Specimen Creek Trail is located halfway between Big Sky and West Yellowstone on Highway 191. Just north of the bridge over Specimen Creek, the parking for the trailhead is on the west side of road and is simply labeled “Specimen”. The trailhead for Black Butte is further north and is signed as “Black Butte”. The trailhead is on the east side of road, while parking is south of the trailhead, on the west side of road.